Across campus and around the world, core muscles are a known issue for everyone. “Do they exist?” “How can I make them bigger?” “I’ll never get to see them!” “They’re behind the keg!” Everyone loves to hate their abs, but most don’t realize just how important those muscles really are. While getting them in shape can be a nightmare, actually doing so helps you look good, feel good, and think better. And so to help you on your fitness journey, let’s hear it for Bikini Body Mommy, the personal trainer mommy who lost 100 pounds, and has great advice to show for it. The great thing about her site is that she has photos to go along with the workouts, as well as other fitness choices and ideas. 2.) For this one, focus on lifting your hips with your abs. Use your arms and legs to brace yourself. Fully extend your legs, and try to push your hips backward. Hold this for two seconds. Bend your knees, and return to the start position. That’s one rep. Perform ten times. *Wrist issues? Perform this move on your knuckles, or lay back onto your elbows. 2.) Keeping your knees locked, walk your feet in towards your hands as far as you can, until your hips end up in a high “pike” position. Slowly inch back out, reversing the way you walked in, until you return to the start. That’s one rep. Perform ten times. 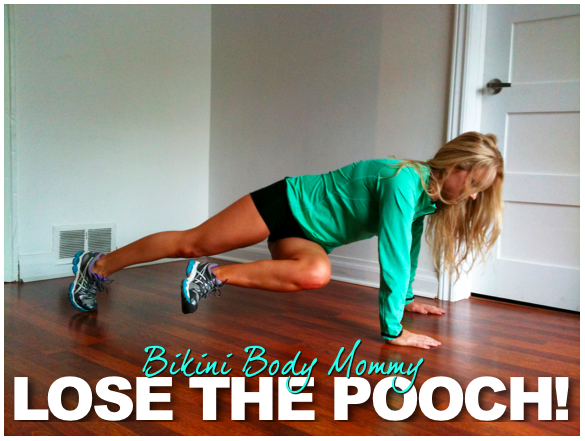 There are a few other workouts available on Bikini Body Mommy’s site as well as recipes and other things fitness. Check it out!